During World War II the Government decided to use amateur radio hams to monitor the enemy. This is their story and how Arkley played an important part in that war. The Radio Society of Great Britain was approached with a request to sound out trusted radio amateurs to see if listening could be arranged on a voluntary basis. Fortunately although their transmitters had been impounded at the outbreak of war they still had their receivers and they could all read Morse Code with a particular in reading faint signals in noisy backgrounds. Each amateur was checked on MI5 records and visited by the local police to see if there was any reason why they could not be trusted. Before long there was quite an army of amateurs diligently searching for spies, that didn't exist, or the suspected transmitters guiding enemy aircraft to worthwhile targets. The amateurs were given the title Voluntary Interceptors (VIs) and were empowered to enter premises where a suspicious transmission was found. As they were not armed it was a wise precaution to have the company of a police officer. In time a few hundred amateurs were asked to listen on HF for anything they could not recognise as genuine commercial or military transmissions and send them in by post written on a log sheet provided, that showed date, time, frequency and what was heard. A few experienced people in Wormwood Scrubs checked the resulting logs and notified the amateur where they were not wanted or further intercepts were required. The organisation was given the title of the Radio Security Service (RSS) but it became apparent that the reason for its existence was false and there appeared to be no reason for continuing. Already the armed services were setting up their own stations to expand the monitoring of types of military transmissions and there was a long established de-coding department in room 40, as the department was called, in the Admiralty building. The Post Office and the Police had radio operators routinely checking the air waves so the RSS was out of a job. It transpired that all was not lost: the amateurs were not put out of work by any means. They were logging whatever was heard and amongst it all located some strange stations using Ham Chat but with 3 letter call signs and on top of that sending messages in 5 letter groups of code. This was strictly forbidden for amateurs. However MI5, located in Wormwood Scrubs prison (with cells for offices) were in charge of looking at these reports (called logs sheets) where Lt. Hugh Trevor-Roper (later Lord Dacre) (click here) in concert with Cpt Gill worked on the messages and actually managed to decipher some to discover that they were in a hand cipher that translated into German. Moreover the translation showed that they were not ordinary signals but apparently coming from the German Secret Service (called the Abwehr) or something equivalent to our MI6 only more widespread to include other unpleasant organizations set up by the Nazis. Bletchley Park, previously uninterested or too busy, immediately took note and required all future messages to be sent to it and strictly no more self styled de-ciphering was to take place. It became apparent that there was a lot to be uncovered about these secret transmissions and amateurs were recruited as VIs on an ever-increasing scale to cover the British Isles. Ultimately about 1,700 were engaged on intercepting although not at one time as many were called up, some for other duties, but many to work full-time, in uniform, for the RSS. As the organisation grew it became necessary to set it on a semi-military footing with full time operators and other staff. Owing to air raids and the need to expand it became apparent that Wormwood Scrubs was not ideal and M.I.5 moved out to various other sites. The RSS was taken over by M.I.6 or Secret Intelligence Service (SIS) as it was widely known. A sub-section of M.I.6 was taken over by Brigadier Gambier Parry and labelled Section VIII. 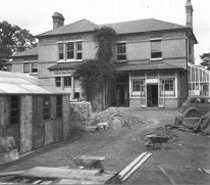 This was furtherdivided into Special Communication Units (SCU) and the two dealt with here were SCU3 and SCU4 The RSS moved on October 3rd 1940 into new headquarters at Arkley View, within a large site 2 miles north of Barnet. This building was already being used by the Post Office as an intercept station. The ‘View’ housed the analysis, intelligence, direction finding control and various administrative departments. Huts were erected in the grounds for intercept work, a teleprinting terminal, and later the ever-expanding departments to identify, classify and collate the enormous secret intelligence enemy radio networks. The secret cryptic address became well known to the select as PO Box 25 Barnet, this being the new postal address for V.I.s. Arkley View was on the right of Barnet Road leading to Stirling Corner. Arkley Lane had the View on its left and Oaklands to its right. Here was accommodated the orderly room and the despatch riders’ base for taking intercepted messages to Bletchley Park. Officers’ and sergeants’ messes were in Scotswood opposite the View. 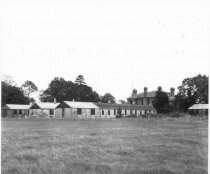 Other large houses such as Rowley Lodge, The Lawns and Meadowbank were used as billets, messing, transmitting and training schools. In Ravenscroft Park, High Barnet, a billet, operators’ evaluation and a small intercept training station were established, run by CQMS Soames (later transferred to the Lawns). The large country house, Arkley View, was known to all SCU3 enlistments, as the induction to this branch of M.I.6 invariably took place here. Enrolled initially by Lord Sandhurst, soon to be followed by Captain (later Major) Bellringer, a short black-moustached officer, recruits took the oath and the King’s shilling, which is where the resemblance to the generally understood army finished. The account of one early enlistment can be read here. A ‘normal’ army enlistment was provided with an Army Book 64 (AB64) parts I and II. Part I contained such personal details as date of birth, service number, rank with promotion dates (if any) and the date when various chemicals were injected to protect the recipient from all the various bugs which arose from service to one’s country. This concern for his welfare was followed by details of his next-of-kin and an invitation to write his will, (acceptable without a witness). However SCU prospective soldiers did not receive AB64 part II because this gave a record of pay which in this case did not come from Army funds but from the Foreign Office. This presented a problem for overseas postings which was solved by issuing part II and paying the army rate at the usual pay parade. The recipient was required to open a bank account at home to accept the balance of his RSS-enhanced pay. Under Lt Colonel Morton Evans the various departments were mainly located in one-storey buildings each about 100 feet long, at the rear of Arkley View house. These were called huts and were frequently extended, as the need arose, in a similar manner to Bletchley Park. Under the general heading of Discrimination were the departments General Search, Groups, Collation and Allocation. Reports from interceptors came to Arkley where, after processing as explained below, copies of the same messages from different intercepts were compared to enable a good copy to be forwarded to Bletchley Park. Initially the intercepted messages came in from the VIs, working at home in complete secrecy and using whatever time was available. Many had full-time employment but others who were retired or disabled could devote more time to listening on the receivers that they had previously used as Radio Amateurs. At Arkley it was realised that for full coverage of the ever expanding German secret networks some form of 24 hour watch was required and in different parts of the UK in order to maximise the amount of information we could obtain. More details follow later. The principal work was the scrutiny of logs and the placing of the intercepted messages in the relevant groups. Box 25 received a thousand or more log sheets daily from V.I.s and the full-time interceptors. These had to be examined to identify new Abwehr services and to sort the familiar ones into their allotted groups. More than 14 different groups had been identified, each having a number of services from perhaps a dozen to a hundred or so. Hence if General Search labelled a message 2/153 it would mean group 2, usually Berlin, and service 153 which could be a link to, say, Madrid, Oslo or Milan. The identification was by means of time, frequency, type of procedure (or preamble if there was a message) or possibly the call sign. This latter was problematic as often call signs changed daily. One task was to examine logs for intercepts which had not been positively identified and to try to discover where to place them or even if they were wanted by us at all. If the operator sent us a previously identified station we sent the details to the relevant Group Officer, located in the next hut, who would then advise the operator whether it was ‘already covered thanks’ or ‘still wanted’. He would have from two to a dozen staff according to the group size. A large wall map was kept in the ‘Group’ hut with coloured wool stretched between points showing the location and working of the various stations. To prevent a casual visitor from seeing the extent of our discoveries, this map was covered with a curtain which was activated by an electric motor. No doubt the local wool shop did not ask questions. If it had, there would have been a ready misleading answer. Log sheets were stamped as ‘suspect’, ‘watch please’ or 'unwanted' if due to be returned to the interceptor. If the signal was not the enemy secret service we used the ‘unwanted’ stamp. Other stamps were: ‘unwanted Hun’, ’more please’ and ‘OK covered thanks’. It was important to find out who was 'working' to whom. As the frequencies and call signs were constantly changing the only common factor was time and possibly operating procedure. Types of preamble and times and frequencies had to be memorised by the staff, who used card indexes for reference. This work could be tedious and tiring as hundreds of log sheets were scrutinised for the brief suspect transmission. It became apparent, quite early on, that VIs could not cover all that was required to understand the Abwehr and to penetrate the German secret intelligence networks. Full-time operators working eight hour shifts were required and purpose-built large huts were equipped with the American first class HRO receivers . These were working by 1942 and other large stations were at Forfar and Thurso in Scotland and Gilnahirk in Northern Ireland. The operators were recruited from several sources although mainly from the ranks of VIs. Later intercept stations were installed in the Middle East and Gibraltar. Gradually about 14 separate groups covering different areas were identified. Group 2 was by far the largest and with its centre near Berlin had links (known to us as services) extending over Europe and beyond and was the mainstay of the Abwehr. We designated them as 2/141, or 8/254 for example where the group came first and then our number reference for the service. An officer, with a staff proportionate to the size of the group, was responsible for keeping the record up to date and issuing daily amendments, as the services frequently changed and grew. When messages had been checked for mistakes and omissions, by comparison with other copies, they were sent to Bletchley Park for de-ciphering. It was important for this purpose that the 'group' was identified, for instance groups 1 and 6 were naval intelligence. Group 2 had links with other centres or sub groups such as group 5 in Prague, 7 in Vienna and 8 in Italy. Group 3 was the infamous SD under Himmler so we may guess at what some of their traffic revealed. To build up a complete picture of the enemy networks it was vital that we found the location of each transmitter. We therefore relied heavily on the nine or so direction-finding stations which were distributed as widely as possible over the UK. Cyril was born in Honiton, Devon on 16 June 1910 but moved to Brighton as a boy and thereafter lived most of his life in Brighton. In early 1939 a Colonel Yule asked Co. Worlledge who ran the Intercept station in Sarafand in Palestine how signals could be intercepted in Britain. The latter recommended Lord Sandhurst as being the onIv one who had sufficient experience, and who had been in WWI. Lord Sandhurst, or Sandy as he came to be known, set up the Radio Security Service (RSS) by first using Voluntary Interceptors (V1s). The RSS was the government's radio intelligence service and its HQ was initially housed in Wormwood Scrubs prison, C Block! Lord Sandhurst approached the then President of the Radio Society of Great Britain (RSGB). Arthur Watts. for a list of all radio amateurs throughout the country, Cyril being one of these. As time progressed, the government realized the potential importance of these VIs who spent all of their spare time listening in to messages and signals on their amateur radio receivers and reporting back anything of interest they heard. In the areas where they lived their names were given to the Chief Police Constables who were sworn under oath to keep secret the identity of these V1s and to afford them special cover as members of the ARP, Home Guard, or more usually the Royal Observer Corps. When war finally did break out, all amateur transmitting, equipment was confiscated by the Government, but leaving selected radio amateurs (the VIs) with receivers so that they could still listen in. During his period of being a VI, Cyril was approached one day by a knock at the door at 1 A Dover Road, Brighton, (where he had his radio station set up in the attic) and asked if he would like to do special work to help his country. He must have been about 24 years old. Whether he was approached because he had delivered some good results as a VI or as a matter of course is not certain. He had tried to enlist in the RAF but had been turned down on medical grounds. So because he had not been accepted for enlistment in the general services, he agreed happily to go to London to become one of the first civilian, if not the first, (and one of only three other civilians, we understand) to Join the R.S.S., where he was issued with a special pass card as a "specially enlisted" (civilian) member of the R.S.S. This started as a part of M18 and later became a part of section 8 of M16. He was also provided with a uniform of the Royal Signals in case the country was invaded, in which instance he would have been shot as a spy had he been captured in civilian clothes. When the Germans were dropping incendiary bombs on London, it was decided to move the R.S.S. out of central London to Arkley, Barnet, North London, where six big houses had been requisitioned by the government and a number of Nissan huts set up to house the radio equipment that was to be used to intercept enemy messages in Morse. Cyril could understand Morse in German, Russian and Japanese, and could transmit and receive Morse simultaneously in both ears. He also spoke and could understand quite a bit of Serbo Croat and some Slavic languages too, as well as smatterings of other European ones and some Japanese. At Arkley, we understand that he became quite senior as he was good at his job and good at radio, Morse and languages, he trained others who followed him in and also worked closely with Lord Sandhurst in his private office. The Morse messages that were intercepted at Arkley were taken down in code in five letter groups and sent to Bletchley Park, (which later became GCHQ) and where the messages were decoded by the young mathematical brains of the country (Alan Turing being one), and where the German enigma machine code was cracked using the world's first computer, Colossus. Dilly Knox and Oliver Strachey ran the R.S.S. section at Bletchley Park and Lord Sandhurst ran Arkley, which he left in December 1941 to join section 8 of MI6 to run the clandestine spy stations working to all MI6 agents round the continent, leaving Kenneth Morton Evans in charge at Arkley. There is no doubt that without the dedicated work of the RSS, the war would have dragged on for another two or three years as it was the work of the RSS at Arkley to concentrate on the German radio spy network (the Abwehr) which was broken into by interceptors (As were the messages to and from Hitler's bunker). Before the war, Cyril had always been a keen radio amateur, having bought his first radio magazine at the age of 17 and having one of the first government experimental receiving station licences in 1933 when he experimented with crystals at his home in Dover Road, Brighton he became an obsessive radio amateur thereafter. He got his full amateur radio transmitting licence in December 1938. He also obtained a club licence for an amateur wireless station which was run at The Eagle Inn in Gloucester Road, Brighton for the Brighton Amateur Radio Club. The terms and conditions of amateur radio licences have always been very strict in that all radio amateurs must keep a full log of all their communications. QSL cards are exchanged to prove the contacts. It is sadly only in the last decade that former workers at Bletchley Park, Arkley and Hanslope Park have been able to get to know each other because of the oath of secrecy that all of them took, and because afler the second world war and before the cold war with Russia, Churchill had Arkley, (the headquarters of the R.S.S. and where the most secret work was carried out), raised to the ground and all records, drawings diagrams etc. destroyed as a precautionary measure, together with the world's first programmable computer, Colossus, which was at Bletchley Park. A replica of this is currently being re created at Bletchley Park without the aid of the original diagrams that were also destroyed. It is also sad that the secret work of the Radio Security Service and the efforts of all those who were part of it, have all sadly nearly been forgotten. Such work will never again be necessary in times of national emergency, as post war advances in technology have brought about the advent of the computer and the internet which need no introduction to the working generation of today. Before the war, Cyril had been an electrical maintenance and installation engineer, working for himself for a short time after the war. and then the rest of his working life for Adams Bros. and Broadbridge in Trafalgar Street, Brighton where he was their chief trouble shooter. While at Arkley, Cyril met his wife to be, Hilda Smith, who was also engaged on government war work as a shorthand typist secretary. They married in 1945 in Middleton near Manchester and moved to Cyril's home town of Brighton after the war. Sadly. Hilda died in 1981, not ever having known about Cyril's wartime work and successes. She would never have been told any detail relating to the work of the RSS, as members were sworn to secrecy for fifty years and, like other members of the R. S. S., Cyril only began to talk about his work in the early eighties and nineties. At the time of his death in July 2002, Cyril had been a member of the RSGB (Radio Society of Great Britain) for 63 years and had, in that very year, just been awarded the Freedom of Bletchley Park, where annual reunions are now held to facilitate the coming together of those who were employed in secret work during the war and for the detail to become known. He had also been a regular member of Worthing Amateur Radio Club where he was well known and respected for his knowledge on radio matters. When Cyril died he left some 3 to 4 tons of radio and electrical equipment, a great deal of which is present at Newhaven Fort today. Cyril's fellow club members have been most zealous in helping to sort and categorise his radio equipment and to prepare the rooms in which the equipment is now housed.